“Walking up the ladder was probably one of the most memorable moments for me…” As Gene Cernan, the last man to walk on the moon shared his thoughts, we can only imagine what it would have been like for him to look back as he was walking up that ladder, realizing the awesomeness of our universe and the God who created it. 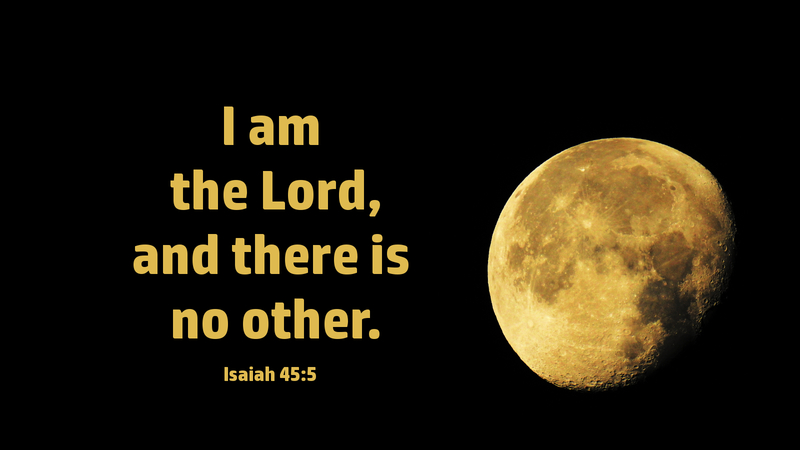 God makes it very clear that He is not like any other god but is the Lord God who created the universe. We and the rest of the universe did not just happen to come into being. When God gave His name through the prophet Isaiah, He repeatedly used His first name—the Lord. For God desires us to know Him personally. That does not mean to know Him as a buddy or friend but to know Him as our Lord and the Creator of this universe. But the most awesome thing of all is that the Lord God who created the heavens and the earth loves us so much that He sent His only Son, Jesus, born in a humble manger to grow up and die on Calvary’s cross for you and me. Prayer: We give you thanks and praise, Lord, for who you are—God the Father and Creator, God the Son and Savior, and God the Holy Spirit and Sanctifier. Amen. Today’s devotion was written by Diana Seaman, pastor of Trinity Evangelical Lutheran Church in Crestline, OH.